These ruins are mentioned in one of the brochures for the Natchez Trace Parkway. We decided to let our GPS take us there, which proved to be a mistake, as we traveled way out of our way. 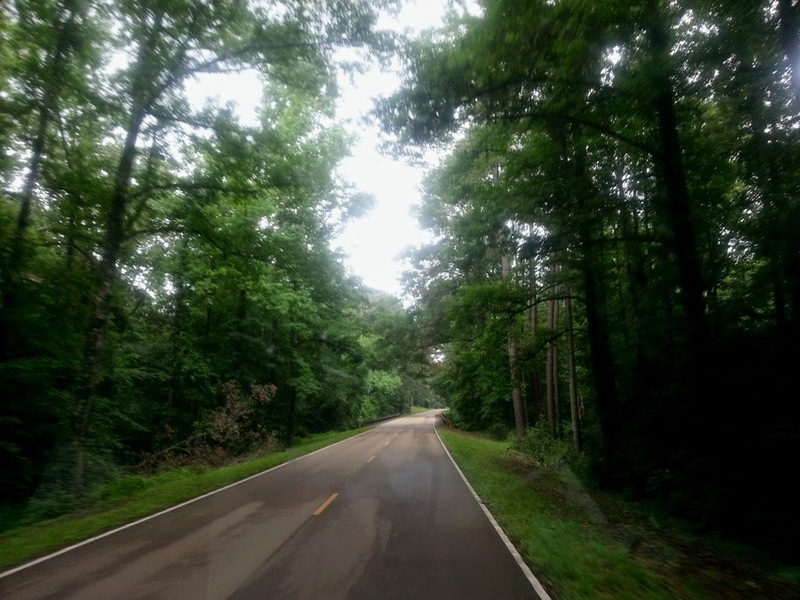 We did however, get to see Port Gibson and a long and narrow road traveling through what must have been plantation country before the Civil War. When you get to the unassuming turn off on what looks to be an abandoned drive except for the Mississippi state sign. You immediately see these large columns that seem so out of place on this nearly deserted country road. We literally drove the motorhome up the path to park in front of where the main entrance to the home must have been. The house was built by a wealthy landowner, Smith Coffee Daniel starting in 1859. He owned more than 21000 acres in Mississippi and Louisiana. The house was among the largest built in this period with the plantation having over 2,600 acres. The house was so large that Mark Twain remarked that it looked more like a college than a private home. The house was completed in 1861. The family moved in and its history of misfortune soon began. Within weeks of occupying the home, Smith Daniel suddenly died at the age of 34. The Civil War soon invaded the property with both the Union and Confederate armies occupying the home. The Confederates used it as an observation post to watch Union movements, and it is said that a Union soldier was shot and killed as he entered the front door. The Union army used the home also as an observation post and as a hospital. The family continued to occupy the home, but most of its wealth was loss with the death of Smith Coffee Daniel and the economic impact of the war. After the war, the home continued to be a focal point for social gatherings, which led to the final misfortune. On Feb 17th, 1890, a careless guest dropped a cigarette on the debris left by workers on the third floor and the house was almost completely destroyed. Since all the drawings and construction plans were lost in the fire, the only known image of what the house looked like is a drawing by a Union soldier completed during the Union occupation and can be seen here. The ruins combined with its compelling history made this a must see for us. We had both Victoria and Nico for the whole day. While we had done this many times, today still was hectic. Nico has learned to walk and can cover quite some distance quickly, as long as he holds his arms up over his head. He looks like he is walking a tightrope. Very funny. It also seems that Victoria is feeling a bit jealous again of Nico and the competition for attention is amazing. The big factor is that we can hardly take our eyes off of them, since they can disappear in a flash. Not to mention a jealous dog thrown in to the mix. There is mile after mile of quiet scenery rarely interrupted by signs of civilization. Many small pull offs offer tidbits of information on the history of the Trace. For those who enjoy hiking, there are stops to walk the trace and see some ruins. Some, like the Steele's Iron Works are very close to the road, just an easy stroll away. It seems that some of these are also used by the locals as a great place to have some summer fun. Other stops simply offer a view of the surrounding country side. Heading south you will see signs for French Camp Town. This town is not on the parkway list of stops and we nearly went by it. It was started in the early 1800's along the Trace as a trading post and inn. It became an education center for troubled boys and later added girls to the program. Today it still operates a school and has a historic district and small museum outlining its history. The town occupies about one square mile and currently has a population of less than 400. It is certainly worth a short visit. The last large exhibit on the Trace is Mount Locust. This exhibit, which has one of the oldest structures in the area, dating to the late 1700's is filled with the history of the Natchez Trace. Here you can learn the importance of the Trace to the "Kaintucks" who transported their goods south on the Mississippi to Natchez and New Orleans. When all the products were sold, they sold the lumber from their barges for use in buildings and walked the Trace all the way home. A one days walk from Natchez lead them to Mount Locust. This traffic caused the owners of Mount Locust to create an inn to provide a resting place for the travelers. Five generations of the Chamberlain family lived on Mount Locust, with the last leaving in 1944. I should mention that there are three campgrounds along the parkway run by the NPS. They are all free and do not take reservations. We did drive through the one closest to Nashville. It was nearly empty and we could have easily camped here, but we wanted to move along. I will say that it was rustic and might be a little tight for larger motorhomes, with lots of tress and curvy roads. I would definitely recommend arriving before dark. In addition to the traveling the parkway, there are numerous towns just off the parkway. We did visit a few of these and it is worth stopping to enjoy a bit of small town America. I will have one more post on an excursion off the parkway that we really enjoyed and well worth the diversion. A hectic couple of weeks have kept me from the blog. This included a whirlwind trip to San Antonio to help our youngest daughter, Katie, house hunt for her upcoming move for her next assignment at Randolph AFB. Living in Florida, we are pretty well adapted to summer heat, but even so, it was very hot in San Antonio. Luckily, she was able to find a house she liked. We were also able to get in a small amount of sightseeing. 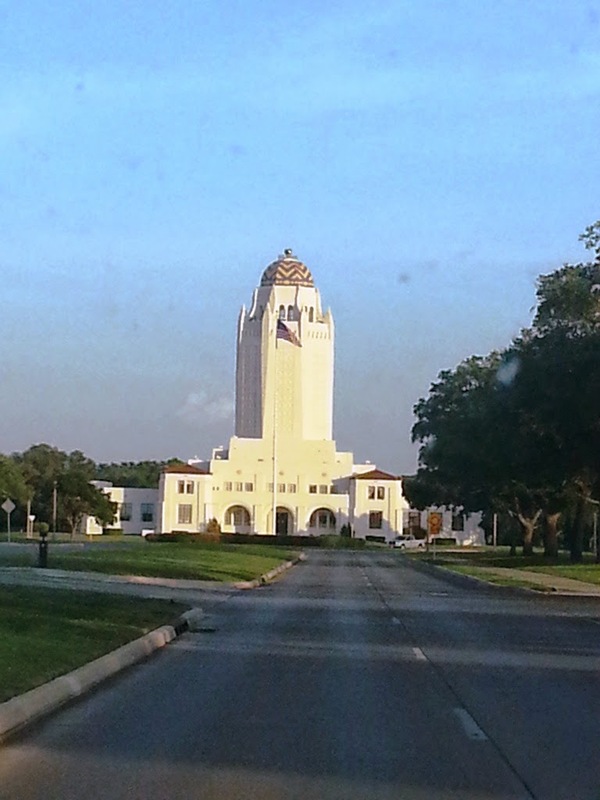 The Air Base itself has a number of historic buildings, including its centerpiece, the water tower at the center of the circle that you see as soon as you enter the main gate. No trip to San Antonio is complete without at least one trip to the downtown river walk area. Now back to finishing the RV trip north where I left off. 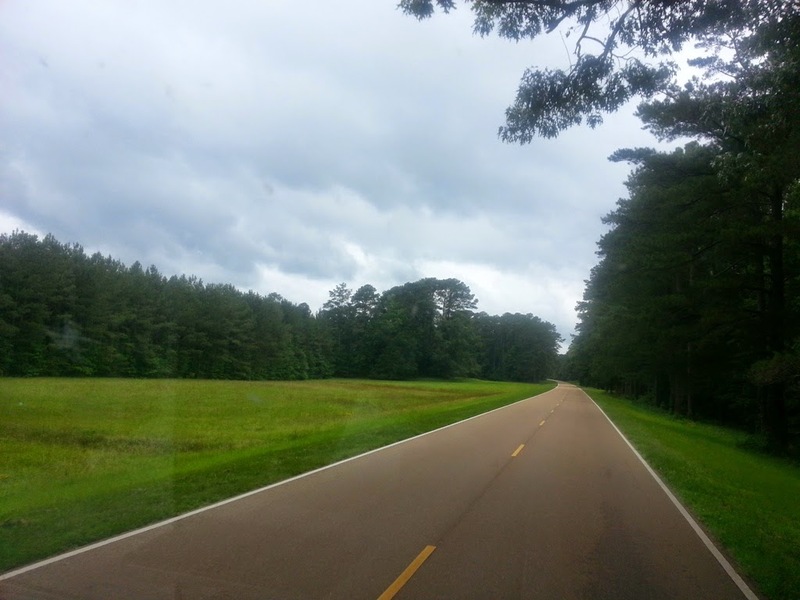 After completing our planned Ohio visits, we decided that we wanted to travel the entire length of the Natchez Trace Parkway. We have made stops along parts of the parkway in the past, but wanted to travel the entire 444 miles from Nashville to Natchez. The parkway travels along the Natchez Trace with numerous spots along the way to absorb at least some of the nearly 10, 000 years of history while the trail was in use. We started at the northern end and headed south. The parkway itself reminds me quite a bit of the Colonial Parkway in VA. It does not allow commercial traffic nor advertising and the only signs to be seen are limited exit and entrance markers. It is a scenic and relaxing drive, but to really enjoy the experience, you have to have some appreciation for the history of the trace. The top site on my list was the gravesite of Meriwether Lewis. After reading the Lewis and Clark diaries, this was a must see for me. Lewis traveled the Natchez Trace after leaving New Orleans for a trip to see the President of the United States. He arrived at the Grinder's Inn on 11 Oct, 1809 to remain overnight. He was found dead the following morning. There was a good deal of mystery and uncertainty about his death. The circumstances remain unclear today. Two of the main theories are: that he committed suicide because of numerous personal problems; or he was murdered to obtain the documents he was carrying to the president. There was some speculation that these may have involved his position as Governor of the New Orleans Territory. We will likely never know the truth of his death. He was 35 years old. There are many places along the parkway to see and hike the original Natchez Trace. Among the most popular of these is a section known as the sunken trace. Here you can see how deep into the earth's surface the trail has been worn over the many centuries that man and animals have traveled along the trail. Another interesting stop is the gravesite of 13 unknown Confederate soldiers. It is not known how they died or exactly when. It is possible that there were more dead here that were later moved. It is thought that some of them may have been originally identified, but since the original markers were long since gone , no one can be sure. A great fear among Civil War soldiers was that they would be so injured during battle that many carried letters or other materials that would help identify them after they died. It is also possible that these materials may have been removed from these men. In 1940, Senator Bilbo arranged for marble headstones, but they were stolen. The current markers were put in place by the National Park Service. The markers are placed backwards, so that travelers on the trace might read them. There are several stops along the way to observe the Indian Mounds sites located along the trace. The largest are the Pharr mounds which have eight large dome shaped burial mounds covering 90 acres. They were built between 1-200A.D. Next time more about the trace and surrounding areas.